A series about life working in a ward office in the heart of a bustling city. With as many series that feature a school setting, it’s nice to nice a change of scenery to the work place. If this ends up being a fraction as funny as Working!! (also produced by A-1 Pictures), then we should have nothing to worry about. Translating to “The Sun Penetrates the Illusions,” this original series seems to be surprisingly dark. I really like how the girls utilize tarot cards to unleash their powers. The unique animation style also creates an atmosphere that’s quite different from everything else being offered this season. So East meets West in this series as a girls from Japan and Great Britain converge at the same school in Japan. Sick of cute girls doing cute things? Well, too bad because Japan apparently isn’t. The character designs seem really nice, so it’ll be up to how their personalities interact with each other in terms of how the series will hold up in an already crowded genre. From the creator of Code Geass, Goro Taniguchi, comes an original series about sentient female dolls that battle with cards. What…? It sounds ridiculous and yet I’m so enticed by the premise. After watching Mahou Shoujo Madoka Magica, I’ve been wanting to watch a “traditional” mahou shoujo series so maybe this will provide me with that chance. Also, the fact that the music director is Yasuharu Takanashi (Fairy Tail, Naruto Shippuuden) greatly excites me. A not-so-serious action series that’s reminiscent of Ao no Exorcist, Blood Lad centers around the head vampire of the underworld. He’s kind of not a good vampire because he’s more into Japanese culture than he is sucking human blood. The story begins when a human girl wanders into the underworld and gets herself killed, forcing him to find a way to bring her back to life. Apparently, there are three types of residents in Kyoto these days: humans, tanuki, and tengu. The series focuses on the Shimogamo family of tanuki that’s befallen by tragedy when the father is eaten by humans. As serious as this sounds, I’m sure a very surreal comedy is built around this. The heavy Sayonara Zetsubou Sensei influence can be felt in the artwork, both done by Kouji Kumeta. More all-girls school fun, this time with even more yuri overtones by the looks of it! The girls academy is known for bringing up very proper ladies, but of course that must mean there are a bunch of problem children as well. The boyish Riko offers to help the polite Maki with her romance skills, after discovering Maki practicing kissing with a pillow. Resident city boy, Yugo Hachiken, wishes to become independent of his parents. The solution: enroll in an agriculture school and hope that his intelligence is enough to get him through. It wouldn’t be a good series if everything worked perfectly though, right? Better get your Harvest Moon boots on for this interesting spin on school comedy. Advertised as a “nonsense comical mystery,” InuHasa seems to start with death right from the get-go, like Blood Lad. Our protagonist is huge fan of novels, which leads him to take a bullet in order to protect his favorite author. He is then reincarnated as a dachshund and the woman he protected turns out to be quite sadistic. Well, this is certainly an interesting premise for a harem. Due to a remarriage, a girl finds herself living with 11 new step-brothers. Even by harem standards, that is a ridiculous amount of characters, but enough to satisfy every possible need for the resident bishounen lover. Now THIS sounds quite interesting. It takes place in a world that is abandoned by God, which means that people can no longer die or be born. A young girl acts as a gravekeeper and digs graves for her townspeople for the fated day when they will die. Well, she called it because one day their town is visited by a mysterious man and everyone except her is killed. Definitely the most enticing story this season. The game centers around Hope’s Peak Academy, in which only the best athletes and geniuses can gain admission. However, the protagonist, Makoto Naegi, seems to have no outstanding qualities other than simply being outstandingly lucky. One day, all the students are trapped in an alternate version of the school by a crazy bear (Persona 3 + 4? ), and the only way any of them can escape is to murder a fellow classmate. This series will adapt the gijinka game where each girl personifies a console (Wii, Xbox 360, PS3, etc.). If that’s not enough to coerce you to watch the series, then I don’t know what will. Of course, you might be one of the people who will turn away in disgust. I, on the other hand, am pretty stoked about this comedy gold right here. Looks like we’ve got another case of delusion on our hands, and this time we have Kuroki Tomoko, a master of otome games! Much to her surprise, high school is nothing like it is in the video games (ain’t that the truth, though). What follows is surely to be a series of misadventures as Kuroki attempts to cope with this stunning revelation. The 3rd season of The World God Only Knows and is dubbed with the “Goddesses Arc.” Readers of the manga will know what this means and at the same time be very confused. In short, this could possibly cause some skippage between the 2nd and 3rd seasons. One thing we can be sure of is that this season will be where the story takes its incredibly sharp turn. I’m excited, but concerned at the same time. Okay, so this is an OVA, but I’m too excited for it that I couldn’t resist putting it here. 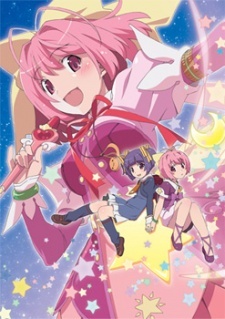 It features Kanon Nakagawa from The World God Only Knows as a magical girl. Enough said, honestly. Based off the popular manga, Kimi no Iru Machi also came out with a less than impressive OVA last year. This series will most likely start from the beginning of the manga, unlike the OVA. The story follows Haruto Kirishima and is sure to be filled with raging hormones and plenty of love triangles. I’m personally not a fan of Romdrams like this, but I know there’s a pretty big audience for it. What Summer 2013 series tickle your fancy?